Meet Brittany McConnell (I'm sure most of you already know her though!). This will be my first post in what I hope to be a series of Q&A interviews of inspirational women cyclists in the community. Brittany is one of the nicest and most friendly people you will ever meet. She is always willing to help others out. I can remember Brittany inviting me along on cold winter rides when I was just beginning and having to wait for my slow a** while she probably wanted to go much faster to keep warm! I also remember her patiently showing me how to hop over a small log at a cross race last year (I made her demonstrate repeatedly before I worked up the courage to try). And she is always there to give support and advice. She is a good friend. In additional to being so sweet, Britt is a phenomenal racer. She excels at cyclocross, is a great mountain biker, and also races road. Read below to learn more about her! I started commuting by bike when I started College in Hawaii back in 2000 for the reason that I did not have a car. When I returned home to Iowa I continued to commute by bike when possible. 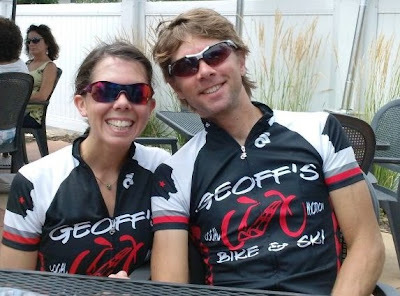 I truly started becoming a 'cyclist' when I met my husband Kevin in 2003 or 4… He is a Bike Mechanic at a local shop, Geoff's Bike and Ski, and introduced the sport to me. At the beginning we would do casually rides and compete every now and then. Our passion for the sport progressed exponentially and now are competing almost every weekend, if possible, and training all week as well as continuing to commute by bike. The different varieties of competing, Road, Cyclocross, Mountain- There is something to do year round! I love them all and it keeps things interesting. Do you have a favorite race and/or place to ride? I don't really have a certain place or race, but my favorite time to ride is when my husband and I have a day off together to ride our own ride. No matter where it is, it is always my favorite. I have been a competitive athlete since Jr. High with long distance running. Along with cycling, racing has kept me confident, determined, and healthy-both physically and mentally. I love the feeling after a long ride of accomplishment, pain, exhaustion, and well, toughness. I have also met some of my most best friends and love sharing those feelings with them. Any goals for the season or upcoming season? I am determined to learn how to bunny-hop!!!! Long distance running, baking, professional organizing and rearranging my house :P, Thursday night outings with friends, sewing (a little bit), and photography. race in Iowa City, three years in row! You have a pretty sweet new job, can you share some about it? I just started my job in May and absolutely love it. 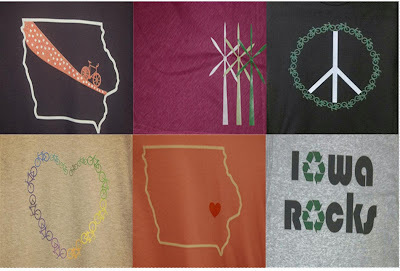 I make t-shirts for a local business, Iowa Book LLC. 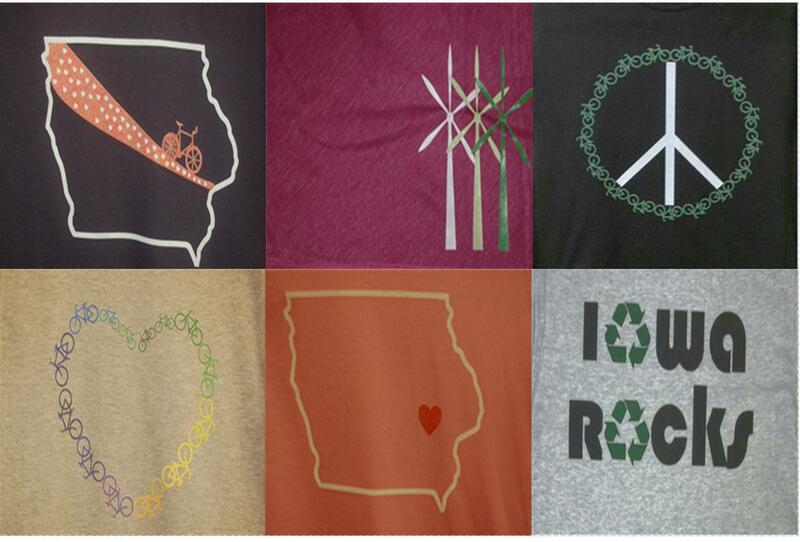 Currently I have been making RAGBRAI shirts for some teams. I also make shirts on the spot for any customer that has an image that would like printed. It's fun to see what people come up with. Do you have a favorite cyclist or racing team? So this is what I lack, the knowledge of the professional cycling world. Although I will say this, I have been a fan of the movie Off Road to Athens. My favorite Rider would be Todd Wells, after meeting him personally and my husband working as a mechanic for him at our local race, Jingle Cross, we have learned how sweet the man. He is an extremely talented rider and still has a very down to Earth personality. What do you think is the best way to promote women's cycling? I talk to any woman I meet about it. Tell them how I started and how much fun it is. Women tend to be pretty shy and not confident enough and I try to explain to them that's how we all start out. I try to tell them it doesn't matter your skill or experience level it is still fun! and a great activity to do with your family and friends. I am fortunate that my husband and I both ride and compete, so we do get to see each other a lot. It is also nice because we then understand what it is like to train, compete, feel exhausted, and the sacrifices we give to be where we are at today, and we completely support each in doing the things that make us happy. I think with work it is just adapting to a schedule and being disciplined enough to train when you have an open window. With running, well that has always kind of been a struggle with me. Every year that goes by I become more of a cyclist and less of a runner. I still go out for a run now and then and sign up for races but pretty minimal these days. How do you push yourself through a really tough race? What goes through your mind and how do you motivate yourself to keep going and not give up? Usually I try to keep my breathing smooth and steady and tell myself to relax. If I am feeling like I am about to give up I tell myself "Just (bleeping) tear it up Britt" sometimes you gotta tell yourself how it is ; ) and I have been taught the famous Rule # 5 from my friends Brian & Kim Eppen. Rule #5 mean, and pardon my language "Toughen the F*** up". I also, which sounds dumb, I smile a lot. Reminds me to have fun. What kind of training did it take you to get to the level you are at now? Do you feel like you've had to sacrifice anything to get to this level? I have sacrificed a lot, but am proud of myself to be at the level that I am and able to compete with some amazing women. I wouldn't give it up for anything. I have started training almost daily, riding with our local group rides, which is mostly men, so I know I am going to have to work hard every time I get on my bike in order to not get dropped. I have learned so many levels of exhaustion and pain that I keep trying to push through each level to get to the next, and l love that feeling. letting me use your wonderful photos! Thank you Brittany for taking the time to answer all of these questions! I really enjoyed reading your responses and I'm sure everyone else will too! I'm really glad that I'm not the only one that "talks" to myself during races :) You have definitely been a role model to me and I'm sure countless others. Seeing you with a smile on your face always puts a smile on my face - thank you for always being so positive!. Good luck with the rest of your racing season - I'm sure you will be a pro at bunny hopping in no time! If you have any comments for Brittany or have any suggestestions for questions for me to ask other ladies for upcoming blog posts please post a comment! Brittany is an inspiration to me too! Liked the write up Emily. I want to know what rules #1, #2, #3 and #4 are . . . ? And, how many rules are there? Brittany, you inspire me too! Emily, this is such a great idea! As social media is a platform where buzz can be hyped within a fraction of seconds then imaging if the buzz is negative.